You are currently browsing the tag archive for the ‘Petrobras’ tag. 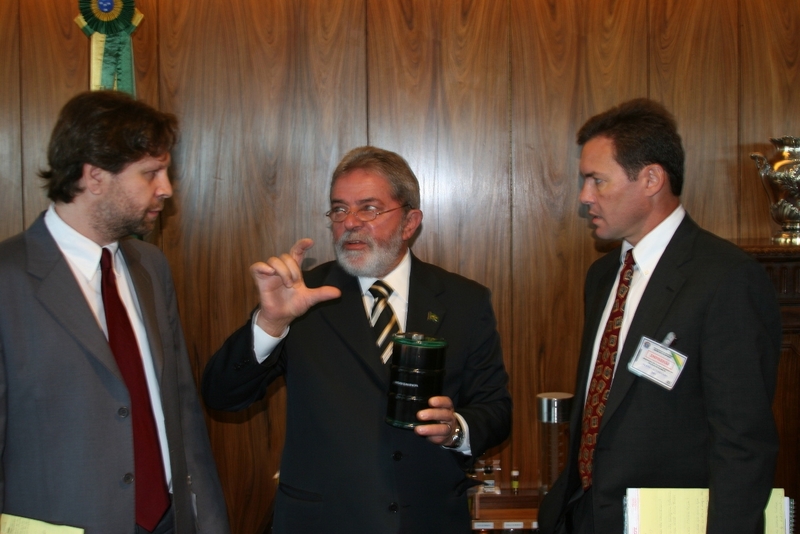 After interviewing Lula a few years ago, he ushered my colleague and I into his office afterwards to show us his collection of oil and biofuels. Behind his desk the president has a stand filled with jars and bottles of different petroleum products and fuels made from crops. Lula, charming as ever with his subjects, was most proud of a small barrel of oil from the pre-salt region, the huge discoveries of oil that are found below more than 5000 meters of water, rock and salt deposits (you can see Lula holding the barrel in the photo below). Commercial production of the pre-salt fields began in July, as I wrote here in the Financial Times. But it just gets better and better for Lula and Brazil. The National Petroleum Agency today announced Petrobras has discovered between 4 and 15 billion barrels of oil off the Atlantic Coast. The field, named Libra, probably has 7.9 billion barrels of recoverable oil and is the biggest yet of the pre-salt fields, the agency said. It follows discoveries of between 5 and 8 billion barrels in Tupi, 3 to 4 billion barrels in Iara and 4.5 billion barrels in Franco. The nearby Jupiter field has between 5 and 8 boe in gas. All in all, that means the pre-salt fields contain a minimum of 16 billion barrels of oil and very probably much, much more than that. It’s great news for Brazil. The questions are manifold at this point but there are two big ones in my opinion. The first is how will they get to the oil, how they will pay for it and how safely they can produce it. The second is what will they do with the proceeds. I don’t doubt they are capable of getting the oil and refining it. How safely they do it is another issue altogether, especially after the BP spill in the Gulf. My bigger fear is that the windfall will not be used for the benefit of all Brazilians. Rich countries that strike oil have historically coped well with the windfall, with Norway perhaps the best example. But for developing nations, the discoveries can often prove disastrous. Nigeria is now better off now than it was before it struck oil. Norman Gall talks eloquently about that issue here. But more Brazilians should be addressing the question. Right now, the climate of ‘God is Brazilian’ has drowned out much of the important debate. A story is written with the best information available at the time. Quite often that information is quickly superseded. Something new happens, or something new is said, or more (or different) information is revealed. The journalist can end up looking lax at best and ridiculous at worst. I say this after reading two stories in O Globo over the last two days. In one, here in Portuguese, Petrobras is accused of covering up the fact pipes on its P-33 platform are horribly corroded. The other reports of a fire on the P-35 platform caused by a leak. Writing about Petrobras is one of the most frustrating tasks I do as a correspondent. The company gives nothing away, even when it is in its best interests. It’s a stupid and self-defeating policy. The best example came shortly after the oil spill in the Gulf of Mexico when I called Petrobras to get an update on their safety procedures. They refused to talk. Nine years ago I wrote a piece for Latin Trade about how three oil disasters had forced the company into reviewing and overhauling its safety procedures. The company vowed to invest $1 billion on training and equipment to prevent more such disasters. And it seemed to work; Petrobras has a safety record comparable with an of its rivals. 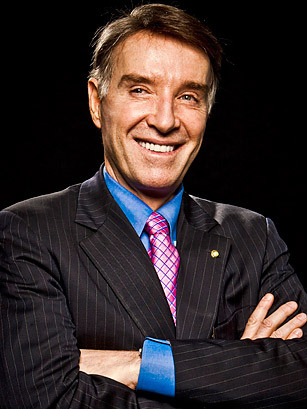 I wanted to write about those advances but Petrobras refused to discuss the issue. The flaks blew me off, refusing to give me any information and not returning several phone calls. They were arrogant and offhand, as usual. I ended up publishing this piece for the Christian Science Monitor, which was written by my colleague Sara Miller Llana. All the information in it was correct. But I knew there was more. O Globo today confirmed those suspicions.